Here's what the best-dressed roast beef sandwiches are wearing this season: crisp-tender sautéed vegetables and pickled pepper rings. Trust us on this one! Cook and stir onions and bell peppers in dressing in medium skillet on medium heat 5 min. or until vegetables are crisp-tender, stirring frequently. Add meat; toss to coat. Cook on medium-low heat 2 min. or until heated through, stirring frequently. Fill rolls with meat mixture; top with pickled peppers. Cut the sodium by 30% per serving by preparing with KRAFT Lite House Italian Dressing and omitting the pickled pepper rings. Add 1 KRAFT DELI DELUXE Mozzarella Cheese Slice, cut in half, or 1 Tbsp. KRAFT Shredded Parmesan Cheese to each sandwich. Prepare as directed, cooking 1/3 cup sliced mushrooms along with the onions and bell peppers. 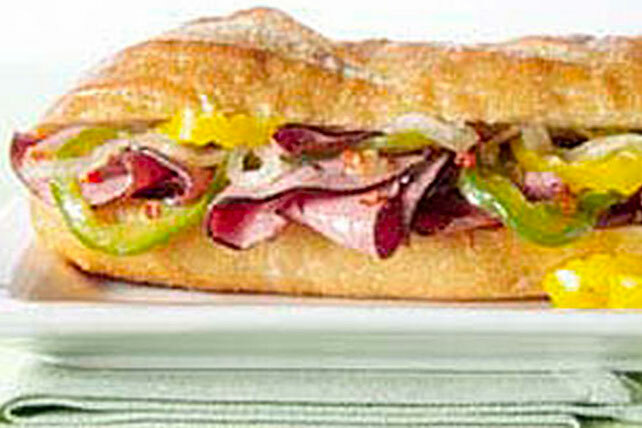 Substitute a mild giardiniera for the pickled pepper rings in each sandwich.